Mutated RAS genes are some of the most common genetic drivers of cancer, especially in aggressive cancers like pancreatic and lung cancer, but no medicines that target RAS are available despite decades of effort. A research team led by CHEON Jinwoo at the Center for Nanomedicine, within the Institute for Basic Science, developed the Nano MRI Lamp: A new technology platform that tunes the magnetic resonance imaging signals "ON" only in the presence of the targeted disease. Our brain is a high-performance computer. One of the key players in this complex system is the AMPA-type glutamate receptor. It ensures that neurotransmission proceeds at a breakneck pace from cell to cell. The mechanisms underlying the stability and plasticity of neural circuits in the hippocampus, the part of the brain responsible for spatial memory and the memory of everyday facts and events, has been a major focus of study in the field of neuroscience. Understanding precisely how a "healthy" brain stores and processes information is crucial to preventing and reversing the memory failures associated with Alzheimer's disease (AD), the most common form of late-life dementia. A new study led by scientists at The Scripps Research Institute and St. Jude Children's Research Hospital shows how a protein involved in cancer twists and morphs into different structures. Patients with Alzheimer's disease run a high risk of seizures. While the amyloid-beta protein involved in the development and progression of Alzheimer's seems the most likely cause for this neuronal hyperactivity, how and why this elevated activity takes place hasn't yet been explained - until now. In new research, Hao Yan and his colleagues at Arizona State University's Biodesign Institute describe a pair of tweezers shrunk down to an astonishingly tiny scale. When the jaws of these tools are in the open position, the distance between the two arms is about 16 nanometers-over 30,000 times smaller than a single grain of sand. In a ground-breaking study, researchers from the RIKEN Brain Science Institute in Japan report a new technique that allows them to visualize the distribution of retinoic acid in a live zebrafish embryo, in real-time. Every time a human or bacterial cell divides it first must copy its DNA. Specialized proteins unzip the intertwined DNA strands while others follow and build new strands, using the originals as templates. Whenever these proteins encounter a break - and there are many - they stop and retreat, allowing a new cast of molecular players to enter the scene. 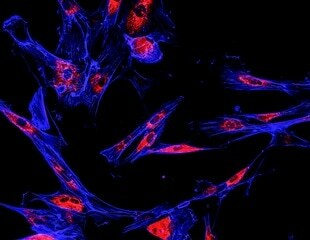 Fibronectin plays a major role in wound healing and embryonic development. The protein, which is located in the extracellular matrix of cells, has also been linked to pathological conditions including cancer and fibrosis. A digital signal processing technique long used by statisticians to analyze data is helping Houston scientists understand the roots of memory and learning, Alzheimer's and Parkinson's diseases and stroke. Neuroscientists have long wondered how individual connections between brain cells remain diverse and "fit" enough for storing new memories. Reported in the prestigious science journal Neuron, a new study led by Dr. Inna Slutsky of the Sackler School of Medicine at Tel Aviv University describes what makes some memories stick. Research conducted by University of Minnesota scientists, in collaboration with Celladon Corporation, has led to the invention of technology to more rapidly identify compounds for the treatment of heart failure. Scientists have developed a new molecular sensor that can reveal the amount of zinc in cells, which could tell us more about a number of diseases, including type 2 diabetes. The research, published today in Nature Methods, opens the door to the hidden world of zinc biology by giving scientists an accurate way of measuring the concentration of zinc and its location in cells for the first time. KRas is one of the usual suspects in cancer. It is a protein that is mutated in 30% of human tumors and has been implicated in the regulation of many cell signalling pathways. Along with new cutting-edge methods, Cold Spring Harbor Protocols is home to an in-depth library of basic laboratory methods. In an Early Edition publication of The Proceedings of the National Academy of Sciences (PNAS) this week, the researchers demonstrate the "alpha-synuclein dance" - the switching back and forth of the protein between a bent helix and an extended helix as the surface that it is binding to changes. In a new study in Nature, Brandeis University Howard Hughes Medical Investigator Dr. Dorothee Kern and collaborators pull back the curtain on the secret lives of enzymes, the ubiquitous proteins that catalyze chemical reactions in the cell.